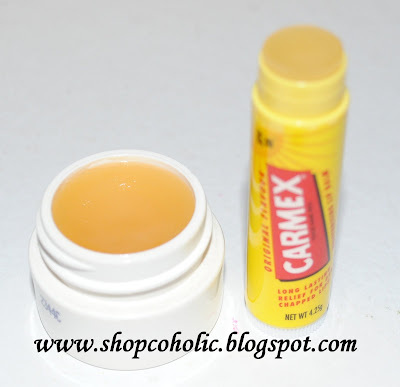 Was running low on my favorite lipbalm- Carmex! Too bad coz this is hard to find here in Cebu City. Imagine my surprise when Carmex Philippines sent me these! <-- click link to visit their Facebook page. 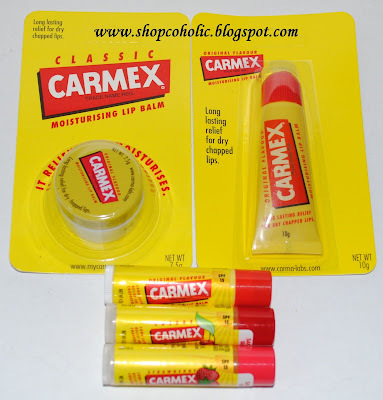 As you all read from my previous post (click HERE), CARMEX tops my list when it comes to lipbalms. 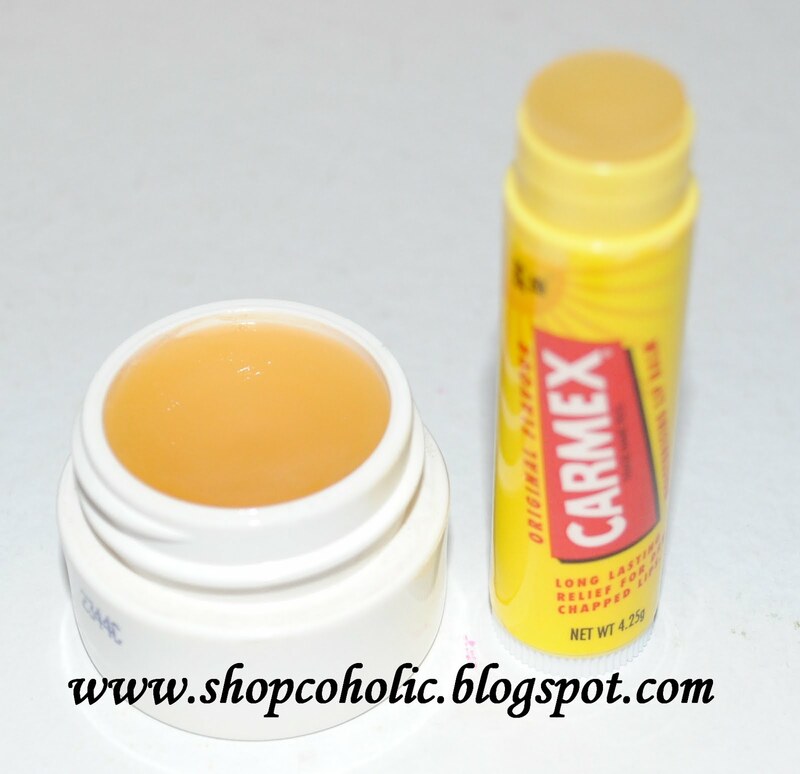 What I LOVE about CARMEX lipbalms is that it instantly moisturizes my uber dry lips and the effect is long-lasting compared to other lipbalms I've tried. It has salicylic acid that exfoliates dry lips and leaves a cool tingly sensation that lasts for more than 15 mins. My favorite Carmex variant is the Click-Stick tube coz its really handy. In fact, I have one in my makeup drawer and one in my makeup bag. Yes, im a CARMEX addict! Been using the tube variant for more than a month now and I've used more than half of it. I apply it everynight before I go to sleep. I really love this product and can't live without it. I even stopped using my Smith's Minted rose lipbalm coz I find this more moisturising. Maybe I'm immune to its medicine-like taste and smell (Original variant) coz I've been using Carmex for more than 3 years already.When this tube runs out, I plan to repurchase the cherry flavored one. What's your favorite lipbalm? Have you tried Carmex? Disclaimer : Products were sent as gift. Carmex is amazing!! The salicylic acid really helps get rid of dead/dry skin and the tingly feeling is so nice :) And it's soooo addicting, haha. My favorites are the rose balms made by CO Bigelow - they're similar to Smith's, but I think they are much more moisturizing. Lucky you for the free lip stuff! :D My lips chap easily and carmex is the only balm that makes them behave. My favorite flavor is the cherry one! I also like the clicking sound the click sticks make haha! Thanks for the review. 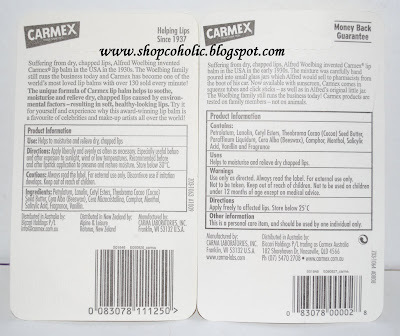 To all Cebu fans of Carmex, we're still waiting for Rose Pharmacy's decision. Do ask them about Carmex. Thanks! I've never tried carmex. After reading all the raves about this lip balm, makes me want to try it even more. I'll just finish my burt's bees balm then I'll definitely check this out. i had tried carmex lipbalms!!!! they are awesome!!!!! haven't but i would love to try! I love carmax. It's the only chap stick that actually moisturize my desert dry lips. i LOVE carmex! unfortunately, so far I can only find the tube and the pot in canada. BUT recently, i got a three pack of the stick version in the states and I'm obsessed! GREAT blog, I'm a new follower :) please check mine out too. can you do a versus post amongst all the lip balms you've tried? @ Quin - you can check my previous post here. My least favorite is the squeeze tube. I've had two of those and both caps (inner) broke. Can you rank the three types (tub, tube, and stick) in order of gloss? I have the tube one and find that it is super glossy, almost like a clear lip-gloss, and am wondering if the other forms are just as glossy.